Advocacy Visit in Kazakhstan: Where Kazakhstan Stands and What Can Be Done? On 18th of March, 2019 TPPR network held an advocacy visit in Astana Kazakhstan. The Institute for Development of Freedom of Information, together with its partner Zertteu Research Center (based in Astana), met with the representatives of the Agency for Civil Service Affairs and Anti-Corruption and the Ministry of Finance of Kazakhstan to discuss the results of TPPR network research. A full day of consultations with different public institutions focused on Kazakhstan’s score and ranking in the TPPR Rating, advantages and disadvantages of Kazakhstan’s Public Procurement Law (PPL), levels of transparency and efficiency and what could be improved. The first meeting was held with the Chairman of the Agency for Civil Service Affairs and Anti-Corruption of Kazakhstan Alik Shpekbaev and representatives of different departments of the Agency, where general findings were presented as to where Kazakhstan stands in terms of efficiency, accountability and transparency of its public procurement system. The second meeting with the representatives of the legal department of the Ministry of Finance focused on legislative recommendations, where experience of over 25 countries were proposed to the Ministry, to make relevant legislative changes in the PPL. Kazakhstan is currently 9th out of 25 countries currently present on the TPPR Rating. The country ranks rather well in terms of PPL guarantees on ensuring competitiveness, efficiency and transparency. Unlike most countries on the TPPR network, Kazakhstan has fully electronic procurement, with paper-based procedures eradicated completely. This is a definite step towards more efficiency in many directions. E-procurement allowed Kazakhstan to create a modern public procurement system with a unified website, providing information on the whole process of procurement – from planning till execution. Important aspect of the transparency is that the information is provided in open data format via an API, creating immense possibilities for analysis of the public procurement system. What is more interesting is that Kazakhstan even provides information on sub-contractors (name, ID, portion of contract received, credentials and contact information), which is still a novelty across all countries present in the TPPR Rating. Despite these evident advancements, legally speaking TPPR experts identified several crucial flaws. Firstly, the machine-readability of data is not guaranteed by the PPL. The law does not mention the open data format and access to information in such format. Despite the fact that in practice access to data is possible, legal guarantees should solidify this advanced level of openness currently available through the goszakup.kz. Additionally, there is one particularity in terms of access to open data on procurement, which we believe is a significant setback. It is mandatory to file a written request to the Ministry of Finance to receive authorization to access information on the site in open data format. Such additional step is considered to be a flaw by the TPPR network, as it may hypothetically cause unwarranted blocking of access to information in open data format. Another issue identified by the experts is the fact that law does not apply to state-owned companies or joint stock companies and any legal entity associated with these companies. There are separate rules for these companies, which include important areas such as transportation, railway, energy etc. Therefore, a big portion of the economy is outside the PPL. The special rules for such sectors lacks the same transparency guarantees, as well as e-procedures. Another issue related to accountability and efficiency is the fact that the PPL has around 49 premises to conduct direct procurement (single source), which is an oddly high number. In fact the reformation process has resulted in the reduction of such premises as before 2018 their number was 55. Specific focus was paid to dispute settlement in Kazakhstan, which lacks public involvement as according to TPPR Standard. Different models were proposed to the Ministry of Finance, including the Georgian model, which includes CSO representatives and Armenian model based on rotation principle among civil servants (members of Dispute Settlement Body). The Georgian model was of particular interest to the Agency for Civil Service Affairs and Anti-Corruption of Kazakhstan. 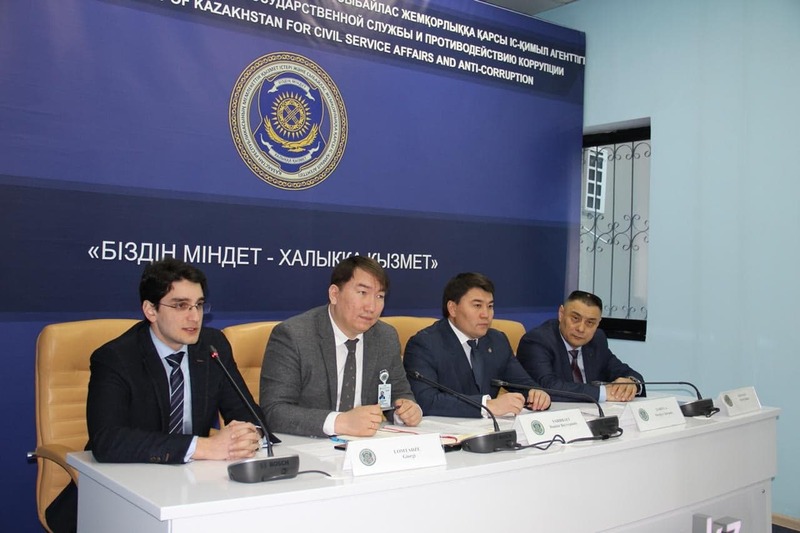 After the meeting a press conference was held within the premises of the Agency for Civil Service Affairs and Anti-Corruption of Kazakhstan, where prospects for future changes as according to TPPR Network Recommendations were voiced before the public. Kazakhstan scores high on the TPPR Rating and in many ways is has a sophisticated e-procurement system. Nevertheless, changes can be made to make the PPL of Kazakhstan more directed towards efficiency and accountability.